Original Nomination Classic Gold Tennis Racquet Charm Stainless Steel. Condition is Pre-owned. Shipped with USPS First Class Package. 9mm Italian Charm Birthstone for April. The colour of this charm represents the Birthstone for that month. They fit any size wrist as you can choose the number of charms in the bracelet, plus you can add or take out links whenever you like. 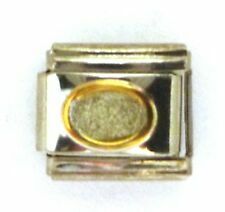 New Genuine Nomination Classic 9kt Rose Gold DIAMOND CHARM. 9kt Rose Gold. Nomination classic stainless steel composable link from the Rose Gold Collection. Fits Nomination Classic Bracelet. Italian Charm DIAMOND BLING BLING 9mm Dangle Charm. Charm Tools. Design your Own Bracelet. Mood Colour Changing. Dangle Charm. Fake Crushed Ice. Type of Charm. 1 x Single Charm. Charm Tools. Mood Colour Changing. Fake Crushed Ice. Type of Charm. 1 x Single Charm. Word & Sayings. Drama, Art, Theatre. Standard Information. Fits 9mm classic size bracelets. Italian Charm. The Nomination Brushed Steel and Diamond Trend Setter Mens Bracelet 021107 005 will be the twinkle in your eye. Crafted from strong stainless steel with a mix of satin and polished finishes with a single natural diamond and adjustable links which are easy to put in and take out yourself, making it fit just right. The best compliment to your personal look. Hand crafted in Italy, Nomination's classic yet innovative charms and jewellery are sure to create a style stir. Supplied with All Official Nomination Packaging. Nomination Bracelet. Pietra principale Diamante. Natural diamond < span class = notranslate ' > 0.01 ct. Natural Diamond < span class = notranslate ' > 0.01 ct. Material: Steel. Case and Nominated Warranty.